Multiflora rambling rose producing clusters of smallish to medium sized semi-double flowers of soft yellow fading to cream. Slightly scented. Vigorous grower with good healthy foliage and nearly thornless stems. Fertile, moist, well drained soil in sun or shade. Suitable for training on a north facing wall. Walls, fences, arches and pergolas. Raised by Schmitt, Lyon, France and introduced by Peter Lambert in Germany, 1896. 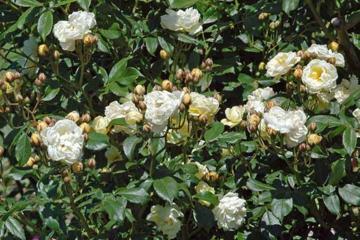 Used as the parent of many hybrid musk roses.